The Continental Sprinter Tubular Tyre is an ultra fast tyre for shorter road events such as criteriums. The nylon puncture protection breaker is incredibly reliable with no loss to the excellent rolling quality. Flexible casing and the incredibly adhesive Black Chili Compound maintains contact with the road even in quick 90° bends. Lightweight and excellent acceleration makes this the fastest tyre in the last 400 metres. - A.D. 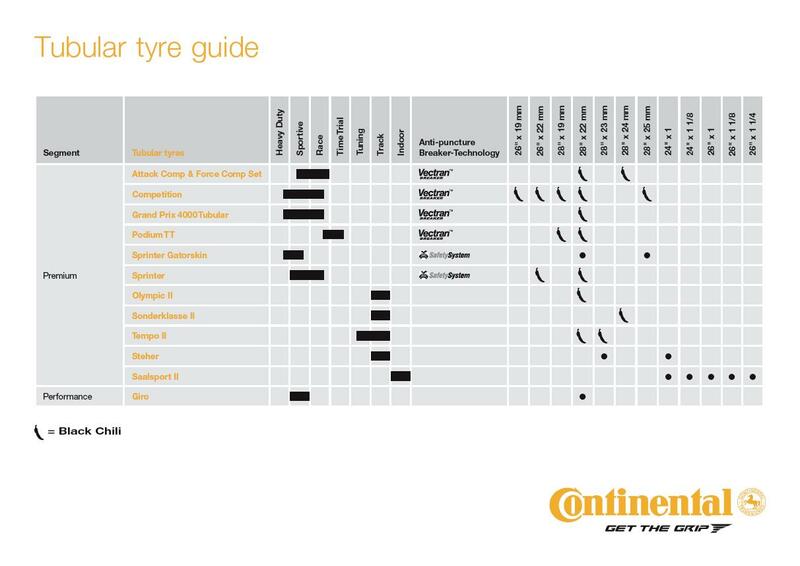 I wa good at continental competitition tubler tyre even though it was expensive. This is my first time buying a continental sprinter tyre. Actually i am satisfied with new tyre. It has higly cost effectiveness than other products. It also has high adhesiveness in any road condition.Generally I would recommand this tyre to the beginner. Good training tire if you don't mind the harsh ride. I see you can get these in a 25mm width now, so maybe that'll help. Otherwise, my Michelin clinchers provide a more supple feel. Relatively easy to mount, inexpensive, and decent performance. You may get 2500 to 4000km on the front, most likely 1500-2000km on the rear, but at this price it's still cheaper to glue up new ones than to run more expensive tubs. I like the Continental 25mm Sprinter. Light enough with good grip and wear resistance. IMHO best training tire at this price point. Bit easier to mount on the rim than the 22mm, though it is a Continental so is a very tight fit. Only have 30 miles on them so way too soon to really put a solid opinion over them. But as far as Pro Bike Kit goes, they are basically half the price I would pay at my LBS... I'd love to support my LBS, but when it comes to paying double I just have to go with PBK for the bigger things! Actually i'm favorite tyre is Gatorskin has good durability. But it's a little bit heavier than other tubular tyre. Sprinter tyre is lighter than Gatorskin, also it has durability. It's very nice tubular tyre i think. Fast, but keeps lunch money in your pocket! I have ridden quite a few tires and this is my first choice at any price. Must be stretched out for a few days and still more difficult to mount than most but I feel they are on to stay. Oddly, I seem to have fewer cuts than with Sprinter Gatorskins. In my 27 years of cycling I have never known of a tire that holds pressure like these Continentals (Gatorskin or Sprinter). Vittoria CX loses 50 psi overnight with latex tubes but these may loose 50 psi per month.